These are the Web Photo Albums from the Round Australia Trip in 2006 and you will find most things still relevant today. Details on petrol and accommodation costs, dates and kilometres travelled are found in the spreadsheet 'Trip Details 06'. You should be able to extrapolate to today's costs. Out of interest you may want to compare with our earlier trip in 1993 - see 'Trip Details 93' ! To see where we went on the Round Australia Trip check out MAPS on the Home Page. There you will also find photos and stories from our BIG TRIP to UK, Ireland and Europe in 2015 as well as other holidays. After Broken Hill we were running out of time so headed north east stopping at only two bush camps along the Gwydir Highway before setting up camp in the Gibraltar Range National Park amongst world heritage rainforests and striking granite outcrops. Here 8 different National Parks join each other on the eastern edge of Australia's Great Divide between Glen innes and Grafton. Have a look at the photos of our trip to Gibraltar Range National Park . From Adelaide we headed up to Broken Hill along the Barrier Highway and camped out overnight at a rest area. It was a complete change of scenery as we travelled across the dry barren land that was in stark contrast to the green of the Adelaide Hills and the Fleurieu Peninsula. We visited the old mine, ProHart's Gallery, Sculpture Hill and the Living Desert, Miners Memorial and the Broken Earth Restaurant. Have a look at the photos of our trip to Broken Hill. Back on the Fleurieu Peninsula we picked up our van from Second Valley and set up camp at Deep Creek National Park. From there we visited Blowhole Beach which you can only get to with a 4WD. Heading up the east coast we stopped at Parsons Beach then The Bluff at Victor Harbour. We walked across to Granite Island then headed to the Adelaide Hills and Morialta Conservation Park. Have a look at the photos of our trip from Deep Creek up the Fleurieu Peninsula to the Adelaide Hills. We tried our hand at fishing, did a number of walks, visited some wineries and saw some Fairy Penguins (now called Little Penguins for politically correct reasons!!!). This third lot of photos covers the the walks to Sandy Creek, West Bay, Maupertuis Bay, Cape Borda Lighthouse, Scott Cove Lookout and Clifftop Walk, Western River Cove and North Coast Road to Stokes Bay. Have a look at Part 3 of the photos of our trip to Kangaroo Island, SA 3. We visited a number of beautiful beaches and bays on Kangaroo Island. This second lot of photos covers the Little Sahara Dunes, Vivonne Bay, Pt Ellen, Kelly Hill Caves, Snake Lagoon Camp, Remarkable Rocks, Weirs Cove, Cape de Couedic Lighthouse Admirals Arch and Platypus waterholes. Have a look at Part 2 of the photos of our trip to Kangaroo Island, SA 2. We left the van set up at Second Valley Caravan Park and took our tent and car across to Kangaroo Island. The ferry crossing is short but quite expensive so decided to camp for the 5 days we were there. This first lot of photos covers Antechamber Bay, Cape Willoughby Lighthouse, Prospect Hill Lookout, Pennington Bay, Seal Bay and visits to the honey farm, sheep dairy and eucalyptus distillery. Have a look at Part 1 of the photos of our trip to Kangaroo Island, SA 1. We descended down into the Murray Valley near Swan Reach and camped and canoed from the banks of the Murray River. After taking the ferry across to the east bank we followed the Murray River and crossed again south of Tailem Bend. The scenery was beautiful as we drove across Mount Lofty Ranges on the Fleurieu Peninsula to Rapid Bay and Second Valley on the Gulf Saint Vincent. Have a look at some of the photos of our trip from the Murray River to Second Valley, SA . On the drive south to Clare, our first stopover was at Hancocks Lookout near Mt Remarkable National Park. From here we could see all the way across Spencer Gulf to Whyalla and also north to Port Augusta and south to Port Pirie. We travelled through Pt Germein Gorge, stopped at Telowie Gorge then settled in at Clare for a few days of wine tasting and heritage tours in nearby Burra. Have a look at some of the photos of our trip to the Clare Valley, SA . We stayed at Trezona Campground in Flinders Ranges National Park and explored the park from there. We climbed up to Yourambulla Caves to view the Aboriginal Art Sites, walked into the centre of Wilpena Pound, roamed around the Appealinna Ruins, drove through Brachina Gorge and up to Bunyeroo Lookout and hiked up Aroona Valley. Have a look at some of our photos of Flinders Ranges National Park, SA . We left the Eyre Highway at Ceduna and travelled down the west coast of the Eyre Peninsula to Port Lincoln then up the east coast to Whyalla. We stopped at various coastal lookouts from Streaky Bay to Elliston including one at Point Labatt Sea Lion Colony. We saw sea caves, impressive cliffs and wierd rock formations called Murphy's Haystacks. Have a look at some of our photos of the Eyre Peninsula, SA . The Eyre Highway starts at Norseman and heads east across the Nullabor Plain. We stopped at Caiguna Blowhole, Cocklebiddy Cave, Madura Pass and Eucla before crossing from Western Australia into South Australia. You travel quite close to the most spectacular stretch of coastline, the Bunda Cliffs, spotting dolphins and quite a few Southern Right Whales in the Great Australian Bight. Have a look at some of our photos of the Eyre Highway and Nullabor National Park . Cape Arid National Park is 120km east of Esperance and has just as many beautiful beaches and amazing rocky headlands as Cape Le Grand. We saw a LOT of Southern Right Whales here and they were in very close to shore. We also caught a few fish. The campgrounds are a more basic - no hot showers here! Have a look at some of our photos of Cape Arid National Park, WA . The coastline to the east of Esperance is place that is definitely worth a visit. Whale watching, fishing, walking trails, beautiful beaches, wildflowers, rugged cliffs and unusual large granite boulders are just some of the reasons to visit this area. Cape Le Grand National Park has well maintained campgrounds suitable for caravans or tents. The one at Lucky Bay has solar heated showers. Have a look at some of our photos of Cape Le Grand National Park, WA . From Hopetoun you can access the scenic Southern Ocean Road which winds along the coast. We stayed at a beachfront rest area at Mason Bay then headed further east to Esperance. A 'must do' in Esperance is the Great Ocean Drive which takes you past the Pink Lakes, Wind Farms and beautiful blue oceans and white beaches of this spectacular coastline. Have a look at some of our photos of Mason Bay to Esperance, WA . Next stop was Cape Riche on Cheyne Bay. This area is known for its snorkeling and fishing around Cheyne Island (only a canoe trip away). From there we stopped in at Bremer Bay on our way to Fitzgerald National Park. We stayed at Point Ann which is renowned for its whale watching and fishing. Have a look at some of our photos of the trip from Cape Riche to Bremer Bay to Fitzgerald National Park . While staying at Albany we visited nearby Torndirrup National Park to see The Blowholes, The Gap, The Natural Bridge and Frenchmans Bay. We also drove to Porongurup National Park and climbed to the top of Castle Rock. While visiting the Albany Wind Farm and doing the scenic walk from town to Middleton Beach we saw whales and seals. Have a look at some of our photos of Albany and the Porongurups . Further east the forest drive takes you through Tingle trees. We visited the scenic coastline around Denmark - Greens Pool and Elephant Rocks before setting up camp at Cosy Corner Beach. Have a look at some of our photos of our trip through the Tingle Forests & Denmark to Cosy Corner . Heading north from the southwest coast of Western Australia we passed through Beedelup National Park and Warren National Park to see the Karri and Marri and Jarrah forests. We climbed one of the fire lookout trees then headed south again to Windy Harbour which is surrounded by D'Entrecasteaux National Park. Have a look at some of our photos of our trip through the Karri Forests to Windy Harbour. We followed Caves Road from Yallingup to Margaret River and set up camp on Big Valley Station for a few days - more tasting and buying wine, olives, cheeses, yoghurt and chocolate! We interspersed that with more cave visits and exploring along the coast down to Augusta and Cape Leeuwin. Have a look at some of our photos of our trip from Margaret River to Cape Leeuwin . We had seen a fair bit of the Western Australian coast by now and decided we would head inland on our way to Perth. This way we could see if the wildflowers were out and maybe do a bit of wine tasting. We followed the Chittering Valley Wine trail. Once wereached Perth we spent our time tasting and buying wine, olives, cheeses, chocolate, nougat... Perth was one big smorgasbord! We then headed down the coast through Fremantle, Mandurah, Bunbury, Busselton, Cape Naturaliste to Yallingup and Ngilgi Cave. Have a look at some of our photos of our trip from Perth to Yallingup . On our way to see the Pinnacles at Nambung National Park (thousands of odd shaped limestone pillars), we stopped to look at the 'Pink Lakes' at Hutt Lagoon near Port Gregory and stayed overnight at Coronation Beach. We popped in to a number of bays and beaches along this part of the WA coast. Have a look at some of our photos of our trip to The Pinnacles and Nambung National Park . We stopped overnight where the Murchison River crossed the highway before heading into Kalbarri. We visited the inland gorges carved by the Murchison as well as the many coastal gorges of Kalbarri National Park. Very impressive scenery in this area! We also canoed the Murchison River inland from the mouth at Kalbarri township. Have a look at some of our photos of Kalbarri and the National Park . After leaving Carnarvon our next stop was the world heritage listed Shark Bay and the Peron Peninsula, famous for Monkey Mia Dolphins, Hamelin Pool stomatolites and shell beach. We stayed at Eagle Bluff and visited the beaches in Francois Peron National Park and finished the day with a hot bath in the artesion bore water near the historic homestead. Have a look at some of our photos of Shark Bay and Peron Peninsula . Further south, Carnarvon camp area is beside a calm coral lagoon that is good for snorkelling, boating and fishing. It is just 1km south of the Carnarvon Blowholes and is in stark contrast to the rugged dangerous coastline and powerful ocean swells we saw from here north past the Blowholes, Quobba and Cape Cuvier up to Red Bluff. Have a look at some of our photos of the Carnarvon Blowholes and nearby coast. On the other side of the peninsula to Exmouth there is Cape Range National Park and Ningaloo Reef and Marine Park. We spent a week snorkelling amongst the abundent corals and colourful reef fish, hiking up gorges, canoeing Yardie Creek, canoeing the calm waters inside the reef, fishing and walking along the beaches. Have a look at some of our photos of Ningaloo Reef and Cape Range National Park . Just south of Point Sampson is Karratha and Dampier, both mining towns. We had a look at the Iron Ore and Salt loading facilities then headed south to 40 Mile Beach for a few days before travelling to Exmouth on the Western Australian coast. Have a look at some of our photos of the trip from Dampier to Exmouth . The 'sister' park to Karajini is Millstream Chichester National Park. We stopped at Tom Price and toured the mine on our way there. After leaving Millstream we headed for the coast again and stopped at BallaBalla then Point Sampson. Have a look at some of our photos of the Pilbara Region of Western Australia including Tom Price, Millstream Chichester National Park to Point Sampson. Karijini National Park would have to be one of the highlights of our trip. It is set in the Hamersley Range in the heart of the Pilbara. We visited numerous gorges and lookouts, swam in rock pools and went on a number of interesting and challenging walks. Have a look at the two albums of photos of Karijini National Park 1 and Karijini National Park 2 . We headed south on the Cape Leveque road but turned off towards the coast about 25km northy of Broome. There are a number of nice beaches and free camping spots overlooking the water. Then it was back to Broome to restock and get the car serviced before going south. We visited a few of the beautiful beaches along the stretch to Port Hedland. Have a look at some of our photos of Quondong Point, Barn Hill to Port Hedland via the Great Northern Highway. The track up to Cape Leveque improved slightly after Middle Lagoon and ended as bitumen for the last 15 kilometres. We stopped in at Lombadina Aboriginal Community to buy some of their renowned freshly baked bread then set up at Kooljaman Campground at the tip of Cape leveque. Have a look at some of our photos of Cape Leveque and surrounding areas of Dampier Peninsula. We headed up the Dampier Peninsula along the Cape Leveque Road and stopped at Beagle Bay on our way to Middle Lagoon. This place has beautiful white beaches and crystal clear waters. We canoed in the lagoon, did some reef walking at low tide and fished in the small bays and lagoon. Have a look at some of our photos of Middle Lagoon . Just south of Derby is Broome and what a different coastline! Pristine white beaches and turqoise blue water contrasted with the muddy waters and mangroves at Derby. We missed the 'Stairway to the Moon' but were happy to visit the markets, restaurants, Chinatown, Cable Beach, Gantheaume Point, Matso's Brewery and Town Beach. We also swam, went 4WDing and canoed. Have a look at some of our photos of Broome . We decided to take a seaplane flight from Derby to Talbot Bay in the Buccaneer Archipelago. We then boarded a catamaran in the bay and waited for the tides to change forming the Horizontal Falls. A jetboat took us through the falls which is a gap in the limestone ridges. Have a look at some of our photos of our Horizontal Falls Flight from Derby . Windjana Gorge is formed by the Lennard River as it cut its way through the ancient Devonian limestone reefs. It runs for 3.5 km and the sheer walls of the gorge are 100m high. Hundreds of freshwater crocodiles call this area home along with twice as many Corellas. Have a look at some of our photos of Windjana Gorge . Next we headed back along Windjana Way towardsthe Gibb River Road again. Our first stop was Tunnel Creek which makes its way underground beneath the limestone of the Napier Range - an interesting part of the Kimberleys. You need shoes and a strong torch to make your way through the 'tunnel'. Have a look at some of our photos of Tunnel Creek . West of Mt Barnett Station, unleaded petrol is only available again at Derby or Fitzroy Crossing and we were getting low so couldn't visit any more gorges until we refueled. We chose to go to Fitzroy Crossing which is only 20kms from Geike Gorge. We had heard that you can canoe the gorge which we were very keen to do. Have a look at some of our photos of Geike Gorge . Next we visited Charnley Station but were unable to get through to most of the gorges and waterholes they had to offer due to the late wet season. We continued on to King Leopold Conservation Park where we could visit Bell and Lennard Gorges. We camped by the side of Bell Creek. Have a look at some of our photos of the Bell & Lennard River Gorges . We picked up the vans at Drysdale station, refueled and had lunch at the bar. We camped on the Gibb River then headed off again on the Gibb River Road to Mt Barnett Station. We walked to Manning Gorge and Galvans Gorge to look at the falls. Have a look at some of our photos of the Manning & Galvans Gorges . The road into Mitchell Falls was certainly not as good as the Kalumburu Road. We were glad we didn't take the campers in. We visited Mitchell Falls, Big Mertens Falls and Little Mertens Falls. There was spectacular scenery and a number of indigenous rock art sites to look at. Have a look at some of our photos of the Mitchell Plateau (Ngauwudu) . After leaving El Questro the first challenge on the Gibb River Road was crossing the Pentecost River. We visited Home Valley Station, Bindoola Falls, crossed the Durack River and stayed at Russ Creek before heading up the Kalumburu Road to King Edward River. We left the vans at Drysdale Station. We camped at King Edward River campground and canoed, fished, visited the falls and indigenous rock art sites. Have a look at some of our photos of the Gibb River Road to King Edward River . We headed back to Kununurra to restock before heading off on the Gibb River Road. The road had recently been opened up to traffic - 4WD. Our first stop was El Questro which has a number of gorges, springs and walks. The road as far as this station is quite good. Have a look at some of our photos of El Questro Wilderness Park (Gibb River Road) . After our flight we drove into Purnululu National Park along a 50km 4WD track. We took it easy and the camper trailers made it without a problem. We camped at the Walardi campground and walked Cathedral Gorge and Echidna Chasm. Have a look at some of our photos of Purnululu National Park (Bungle Bungles) 2 from the ground. We headed south from Kununurra to Turkey Creek and took a helicopter ride over Purnululu National Park, previously known as the Bungle Bungles. For $250 each you can have a 45minute flight. It is good to get it all in perspective and to see areas that you cannot get to by car & foot. Have a look at some of our helicopter flight photos of Purnululu National Park (Bungle Bungles) 1, WA . We crossed the border into Western Australia and handed over any fruit, vegetables and honey we had left at the quarantine checkpoint . We had been warned about this so had eaten it down pretty well. We restocked again in Kununurra. We visited Wyndham and Lake Argyle as well as sightseeing around Kununurra. Have a look at some of our Kununurra and Lake Argyle, WA photos. After leaving Katherine we travelled along the Victoria Hwy through to Keep River National Park. It is similar to the Bungle Bungles only on a smaller scale and well worth a visit. One part of the park had not yet been opened for the 'season' yet but most of it was accessible. The 4WD track in is in good condition. Have a look at some of our photos of our Victoria Hwy to Keep River National Park, NT . We had hoped that the second time we passed through Katherine we would be able to canoe the gorge and camp out overnight in the gorge. Unfortunately it had still not been cleared of saltwater crocodiles - they had seen one two weeks before - so still closed to canoeing and swimming. We did the boat cruise up the gorge instead which was well worth it. Have a look at some of our photos of our Nitmiluk/Katherine Gorge National Park, NT . Kakadu National park - world heritage listed area - was next. Unfortunately the late wet season in the Northern Territory and cyclone activity caused us a few problems again. A lot of the roads to various sites were still closed. We still managed to see the wetlands, the art sites and sunset at Ubirr, the Aboriginal Cultural Centre and Gunlom Falls. Have a look at some of our photos of our Kakadu National Park, NT . We left Darwin and stopped at the Mary River on our way to Kakadu. We hired a leisure boat for a half day to fish and see the wetlands and its many birds and crocodiles. We took sausages, bacon, eggs, mushrooms, tomatoes and had a BBQ breakfast on board. Have a look at some of our photos of our Mary River Boat Trip . While staying at Darwin we did a day trip into Litchfield National Park to look at the Magnetic Termite Mounds and the various waterfalls. Some of the areas were still closed after the wet season eg Lost City with its weathered sandstone pillars and the southern 4WD tracks, but we easily filled a full day there. Have a look at some of our photos of Litchfield National Park, NT . We had a few problems with roads and waterways being closed due to the cyclones and late wet season so we decided to leave some of the places in Northern Territory (Katherine Gorge, Kakadu, Douglas Hot Springs) until later and headed off to Darwin a little earlier than first planned. Have a look at some of our photos of Darwin, NT . The next part of the trip included the Hot Springs at Mataranka, Edith Falls, Umbrawarra Gorge and the Douglas Daly region. There are so many interesting areas to visit around this area! Have a look at some of our photos of the trip to Matarananka & Edith Falls, NT area. 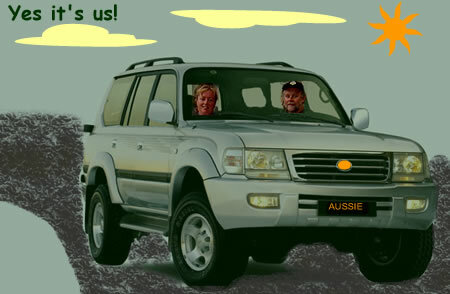 We restocked in Mt Isa and had the car serviced (it is cheaper in Queensland) before entering Northern Territory. We went to Camooweal Caves (Queensland) then Devils Marbles via Tennant Creek (Northern Territory). Then it was north again through Daly Waters to Mataranka. Have a look at some of our photos of the trip to Camooweal & Devils Marbles . It was only 100km into Lawn Hill Gorge, now called Boodjamulla National Park, from Gregory River. This is one of the more remote National Parks in Queensland but well worth visiting. We canoed, swam, went for walks and visited Riversleigh Fossil Area. Have a look at some of our first lot of photos of the trip to Lawn Hill Gorge, Qld . Have a look at some of our second lot of photos of the trip (including Riversleigh) - Lawn Hill & Riversleigh, Qld . We continued up to the Queensland Gulf and stayed at Karumba. There was still a lot of evidence of flooding and previously closed roads but we had no problems getting through. It was amazing how much hotter it was in Karumba. The thing to do here is fish, fish, fish... Then we headed to Gregory Downs on our way to Lawn Hill (Boodjamulla) Gorge. Have a look at some of our photos of the trip to Karumba & Gregory River, Qld . We were lucky that the flooded sections of road had cleared and we were able to continue on along the Gulf Developmental Road (The Savannah Way) to Georgetown where we turned south towards Cobbold Gorge. Maureen & Kev highly recommended the cruise through this gorge and we had heard it was a unique experience as there are not a lot of gorges in Queensland. Have a look at some of our photos of the trip to Cobbold Gorge. We passed Undara Volcanic National Park on our way to Atherton to visit friends for a couple of days and restock supplies again. We visited many waterfalls, lakes and craters. The devastating effects of Cyclone Larry can be seen on the tablelands even though it is 90km from the coast. Have a look at some of our photos of the trip to Atherton Tablelands. Next stop was Mackay to visit friends for a couple of days and restock supplies. We then headed off towards Charters Towers then Hughenden staying overnight at the Campaspe River Rest Area. Our final destination was Porcupine Gorge National Park, 70km north of Hughenden. Have a look at some of our photos of the trip to Porcupine Gorge, Qld . We left Brisbane, Queensland on April 11, 2006. Our first stop was Bundaberg to say goodbye to Pete's parents then off to Awoonga Dam near Gladstone. We met up with Noel, Shirl & kids as well as Maureen & Kev at the dam. Noel had his boat so there was plenty of fishing, boating and canoeing. The dam has plenty of 'barra' to be caught - or so they tell us. Have a look at some of our photos of Gladstone & Lake Awoonga, Qld . Even though the big trip was starting at Easter we still had to do something special for our 25th wedding anniversary. Fiji is 3.5 hours flying time from Brisbane so seemed a perfect choice. We had 5 nights on Bounty Island just off the coast from Nadi and then 2 nights in Nadi itself. Have a look at some of our Fiji and Bounty Island photos. Scenery doesn't changed much so previous years' trips and holidays are still relevant. I have moved the photos from the trips 2010 - 2014 to another web page. This includes the New Zealand trip, Vanuatu trip, Roadtrip Brisbane to Melbourne and Sailing the Whitsundays (Queensland). Feel free to have a look at the 2010 - 2014 web albums.